PICTON, ON – The Collectors of Canadian Brewery Advertising (CCBA), Canada’s national organization for collectors of brewery memorabilia, have selected Barley Days May Bock as winner of their 2009 Label of the Year award. The announcement was made earlier this month during the 31st annual CCBA convention in Kitchener, Ontario. The award has been presented annually since 1983, and recognizes achievement in beer label design. 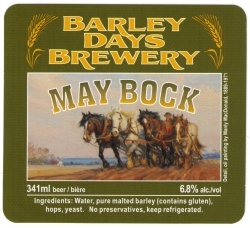 May Bock was launched by Barley Days Brewery as a seasonal beer in the spring of 2009. The striking label incorporates the detail of an oil painting by renowned artist Manly MacDonald (1889-1971). MacDonald grew up on a farm east of Belleville, Ontario, and gained fame for his many paintings of Prince Edward County scenes.